Every once in a while it's a good idea to stand back from the daily necessities of our lives and look back and marvel at what we as human beings have accomplished in our understanding of ourselves and our universe. In very few instances is this wonder more apparent than in an appreciation of the discoveries that physics has made regarding space and time. 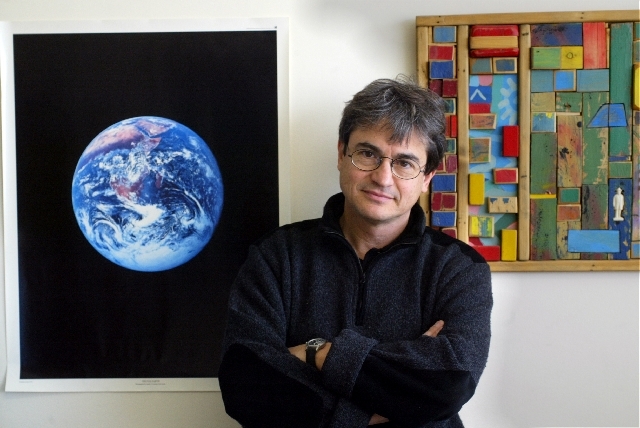 In this short and highly readable book, Italian physicist Carlo Rovelli leads us through a tour of what he thinks are seven of the foremost ideas (or "lessons') in physics. These are ideas which have not just furthered our understanding of our material world but which have also expanded our consciousness and connected us to our origins and future. Rovelli’s writing is often poignant and beautiful, simple and without frills and from the heart, and I would be lying if I said the experience wasn't uplifting. Personally I would have included an extra eighth lesson on chaos theory and complexity since I think those are going to be key scientific issues in the 21st century. Also, there is little new per se in here which would not be familiar to physics aficionados. But as it stands Rovelli's offering is a marvelous feast which should ignite a renewed sense of inspiration regarding the reach and beauty of science even in hardened veterans. The first lesson is about Einstein's general theory of relativity which saw yet another towering validation this year with the discovery of gravitational waves. The Russian physicist Lev Landau called it the "most beautiful theory" and I would say there would be few contenders for that title. The basic equation of the theory fits on a napkin, and the essentials of the framework are both startling and elegant. As Rovelli explains, Einstein's major breakthrough was to realize that Newton's gravitational field is not a field at all but is spacetime itself. That one insight suddenly elevated all of physics to a completely new level and it opened up previously unimaginable vistas - black holes, neutron stars, radio astronomy, the Big Bang - to deep exploration. Here's Rovelli on the essential craziness of Einstein's equation: "Within this equation there is a teeming universe. And here the magical richness of the theory opens up into a phantasmagorical succession of predictions that resemble the delirious ravings of a madman, but which have all turned out to be true." The second lesson concerns the other big revolution of twentieth century physics - quantum mechanics. Relativity is astonishing but its basic tenets are easy to understand. In contrast, even the basic tenets of quantum theory - wave particle duality, entanglement, the uncertainty principle - have left even the theory's great founders befuddled. Quantum mechanics is unique in the history of science as a theory which is spectacularly successful in its practical applications while at the same time continuing to be virtually impenetrable in its philosophical implications. It opened up vast new areas of modern life to understanding; without it computers, chemistry, electronics and molecular biology would be inconceivable. And yet the sheer weirdness of its laws continues to defy every commonsense expectation. Rovelli zeroes in on one of the essential qualities of quantum mechanics when he says that its laws "do not describe what happens to a physical system but only how one physical system affects another". I find it interesting that the same emphasis on the philosophy of interactions which lies at the heart of quantum theory also underlies the science of emergent complex systems like the weather, the stock market, biochemical networks and social networks. The third chapter talks about the Big Bang theory and the architecture of the cosmos. Rovelli wrote just before the discovery of gravitational waves otherwise he would have included them in his discussion but he talks about many other wonders revealed by Einstein's theory combined with many of the tools of modern physics such as radio telescopes and particle detectors. The culmination of applying relativity to the universe must surely be the discovery of the accelerated expansion of the universe, although the presence of what we call "dark matter" leaves something to be desired. The fourth lesson tells us how the findings of quantum mechanics led to an explosion of understanding of the building blocks of the cosmos in the postwar years. Quarks and electrons, Higgs bosons and neutrinos all make important appearances in this story. The culmination of all this progress was the Standard Model of particle physics, essentially a kind of periodic table which lists all known particles and their properties. And yet unlike general relativity the Standard Model is incomplete. Many of the particles' parameters are poorly understood, and the model itself is incompatible with general relativity. In addition there are ugly infinities arising in the theoretical treatment of all those particles which have to be tamed by artificially imposed mathematical order. These deficiencies make the Standard Model very much of a model. It is in the Standard Model that we start to glimpse the first troubling signs of how much more we have to discover in fundamental physics. But in trouble lies opportunity and glory, and in one sense the Standard Model only points to the bounty of undiscovered delights which must surely lie ahead. The fifth lesson tackles one of the greatest scientific facing science, the marriage of general relativity with quantum mechanics; a marriage which as of now seems to end in violent, unholy divorce every time we attempt it. Interestingly there is not a word about string theory, probably because Rovelli himself works on a rival theory called loop quantum gravity. There is a capsule description of the theory which emphasizes again the fact that the framework is less about objects themselves and more about their interconnections. In this case the connections are between tiny quanta of space - which are themselves space. The sixth lesson takes us on a journey into one of the most exciting frontiers of modern physics: the union of thermodynamics, quantum mechanics and relativity. This union is wondrous and critical because it can help us understand perhaps the deepest question we can ponder: the fact that time seems to flow only in one direction. As Rovelli explains, the arrow of time seems to be inextricably linked with the flow of heat. The second law of thermodynamics and its postulated increase of entropy tracks with the forward arrow of time, although on an individual particle level this arrow is reversible. Figuring out these conundrums of time and thermodynamics will undoubtedly take us into some very novel territory. In this context Stephen Hawking's discovery of radiation emanating from black holes is surely a promising springboard. Time, thermodynamics, quantum mechanics, relativity, statistics; it's all here, and it's all tantalizing. The seventh lesson ties it all up together as Rovelli talks about the ultimate entity that allows us to figure all this out - the human brain. He ponders the delectable paradox that an entity which is composed of particles and fields and quanta can also decipher its own mysteries. Understanding this self-recursive extrapolation should keep us occupied for as long into the future as we can imagine, and it's also what should make us cherish our unique existence as sentient beings on this planet. And yet, as unique as we are, Rovelli reminds us in closing that our lowly origins from elemental life forms and the ordinariness of our planet, our solar system and our galaxy should not blind us to what might be the greatest lesson of all: humility and wonder. "Here, on the edge of what we know, in contact with the ocean of the unknown, shines the mystery and the beauty of the world. And it's breathtaking".